The methodology used here requires at least 6 prime years for a player (see below). Some new players that might make the list are not included. Among current players, Antonio Brown is the best, and already has enough time in the NFL to make the list here. DeAndre Hopkins is actually on pace to be #6 all-time if he keeps doing what he's doing. As you can see above, Larry Fitzgerald and Julio Jones are also on the list. Odell Beckham Jr is also on track to make it. He is trending down however, so he'll need 2-3 more years better than his 2018 performance to make it. Davante Adams and Michael Thomas are also on track to make it in the top-20 if they get 3-4 more seasons like their 2017 and 2018 seasons. Dez Bryant still has a glimmer of hope, but he'd need 3 more above average seasons and he's trending down so it seems unlikely. The best season for a still-active wide receiver was Antonio Brown's 2017 season (22nd all-time). statistical performance: how much of a statistical outlier was this player? awards: how did the media and fans rank this player against his peers? The resulting score is roughly 'number of standard deviations above his peers during his prime.' 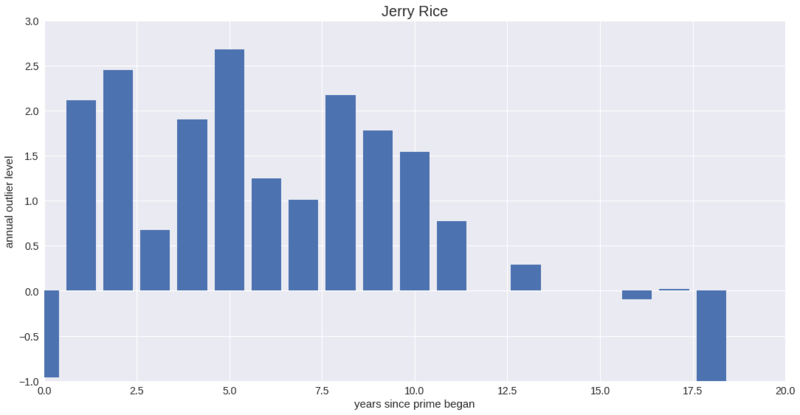 Just how good was Jerry Rice? Here is a comparison between him and Randy Moss. Note that these plots have no scores for some seasons as the player was ineligible due to injury, too little production, etc. Jerry Rice was incredible. His prime is unmatched. He lost a step towards the end of his career, but since this takes the best 6 seasons, that doesn't hurt his score. 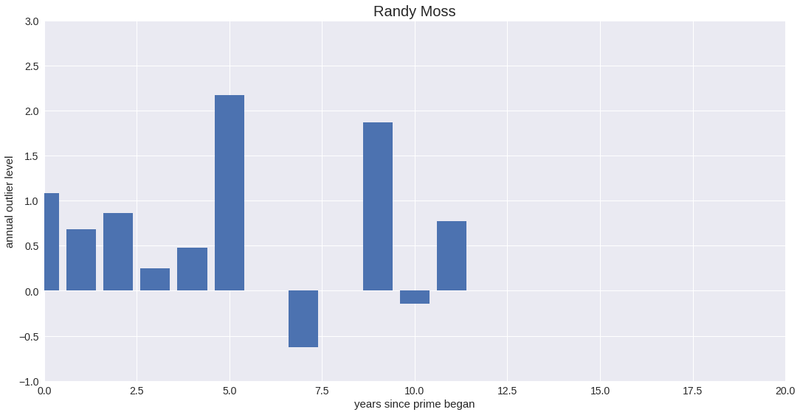 Randy Moss's legendary 2003 and 2007 seasons are about average for Rice during his prime. Rice led the league in receiving yards 6 times. No other receiver in the modern era has led it more than twice. The gap between him and those elite peers was enormous. He actually won the MVP award as a wide receiver! 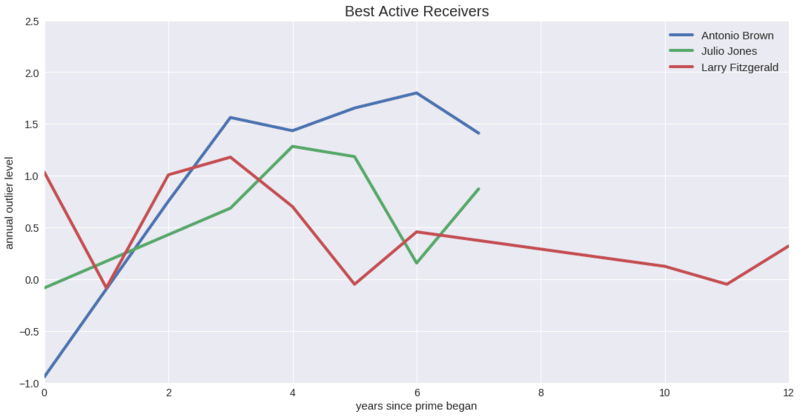 What about active receivers...how do Julio Jones ,Larry Fitzgerald, and Antonio Brown compare? All three of them have been well above average for large portions of their careers. Brown's peak is just higher. Julio's lack of tds is the biggest difference between them so far. I could remove it from the stat score, but it seems like tds and yards are the primary metrics for a wide receiver. For awards, I considered only pro bowl and first-team all-pro voting. The award scores are simple. If a player was sent to the pro bowl, he gets 0.083 added to his score for that season. If he was named a first team all-pro, he gets 0.167 added to his score for that season. A wide receiver who was sent to 6 pro bowls and named a first-team all-pro in 6 seasons during his prime will get a perfect award score of 0.25. I really like this rough methodology for comparing players across eras. If you have any feedback, suggestions, etc., let me know in the comments.